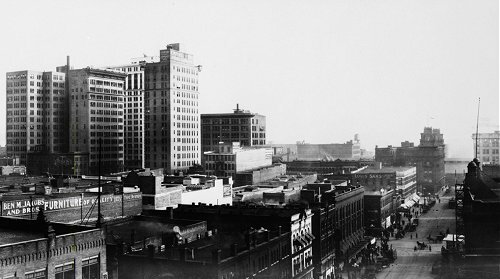 The city of Birmingham, Alabama was founded in June of 1871 to be a hub of industry and trade and was modeled after the city of Birmingham in the Great Britain. But soon after the great depression depleted all the investment and it is not until the year 1912 the city started forming its deep roots. Availability of iron ore, limestone and coal drove much of Birmingham's growth and development and it came to be known as the "The Steel City". Many areas are still named as Bessemer (after the Bessemer converter), Irondale remind today of this legacy. By early years 1900s the African Americans comprised more than half of Birmingham's industrial workers. Working and living conditions were poor, and black citizens' lives were made more miserable by Birmingham's deeply entrenched system of segregation. Nicknamed "Bombingham" for the many racially motivated bombings of black homes, the city became a focal point for the national civil rights struggle after the brutal treatment of the Freedom Riders in 1961. Later, Rev. Fred Shuttlesworth and other leaders of the Birmingham movement invited Dr. Martin Luther King Jr. to participate in a protest of segregated downtown businesses in 1963 that came to be known as the "Birmingham Campaign." King was arrested during these demonstrations and wrote his famous "Letter from Birmingham Jail" as a response to the urging of white ministers to end the protests. The city was then publicly shamed in the media by Police Commissioner Eugene "Bull" Connor's use of fire hoses and police dogs to drive back thousands of youthful demonstrators in early May 1963. Following several weeks of demonstrations, civil rights and business leaders reached an agreement that ended some of the segregationist barriers. This spirit of good will was soon Reverend Fred Lee Shuttlesworth was a pastor and Fred Lee Shuttlesworthshattered by the bombing of the Sixteenth Street Baptist Church, which claimed the lives of four young girls. That horrific event, more than anything else, prompted the passage of the Civil Rights Act of 1964, which outlawed racial segregation in public accommodations in America. With the passage of the Voting Rights Act of 1965, African Americans were increasingly able to participate in the city's civic and governmental affairs, culminating in the 1979 election of Richard Arrington Jr. as the city's first black mayor. The University of Alabama at Birmingham (UAB), started in 1969 as an autonomous institution within the University of Alabama System, grew quickly to occupy a large campus and enrolling big number of students. The growth of UAB brought a lot of great talent from all over the world and research grants percolated to Birmingham area businesses. HealthSouth, started in 1984 by Richard Scrushy also contributed to Birmingham's rapid growth during the 1990s. Present day Birmingham is a modern, vibrant, "under the radar" city that has all the amenities of a cosmopolitan city and the charm of the old south. There's greenery everywhere. The mountainous landscape and the Cahaba River provide for excellent nature views and beautiful backdrop for a relaxed family living. Courteney Cox -- The actress who played Monica in the popular series "Friends"